Daily ARC Marion clients are given the choice of what they would like to do for the day. Without exception, creating art projects brings joy to so many clients, and our art teacher, Lois Letourneau, is contstantly giving them the opportunity to shine. Recent Projects – The Healing Hearts exhibit, on display in the Appleton Museum of Art in September and October 2010, featured original art from various non-profit agencies in town showing the healing power of art. Sponsored by The Centers, each agency partnered up with local artists to learn new techniques and refine their skills. ARC Marion clients were paired with award winning photographer and artist, Kent Weakley, who helped them with their projects. Some of the art was sold at silent auction where ARC Marion client Buck Meadows’ piece sold for $250! Also, for the third year in a row, ARC Marion client art was featured in the children’s workshop at the Fine Arts for Ocala (FAFO) Fall Arts Festival October 23-24, 2010. What makes this year’s projects unique is the art on display was created with supplies purchased from a FAFO grant given to ARC Marion in 2010! Buy ARC Marion Art – A new endeavor for ARC Marion is the ARCtistic Expressions project. Boxed card sets are sold featuring original client art. Visit the Online Store to purchase some today. New touchscreen computers donated by Signature Brands in 2011. Thank you, Signature Brands! Each day our clients are given the opportunity to choose what they would like to do throughout their day. One of their choices is working in the comuter lab. All computers have learning programs installed which can help a person do anything from learning to budget their money to how to tell time. Some people even use them to compose their own short stories or write letters to their friends and families. All of the computers use touch screen technology so that even some of the most medically challenged clients can have opportunities to utilize the computer lab. Our intensive program is designed to work with profoundly disabled people. Their goals are usually more focused on daily living skills than with work-related skills. We use tactile therapies and other forms of stimulation to help our clients experience many things in life that may not have felt comfortable with before. Because of the level of need this is a one to three and sometimes one to one learning environment. Another option for clients every day is to consider recreational activities. Weather permitting, individuals can play basketball, four-square, hoola-hoop and other activities outside. They also have the opportunity to get fit indoors doing exercise videos and other physical activities that meet their recreational abilities. 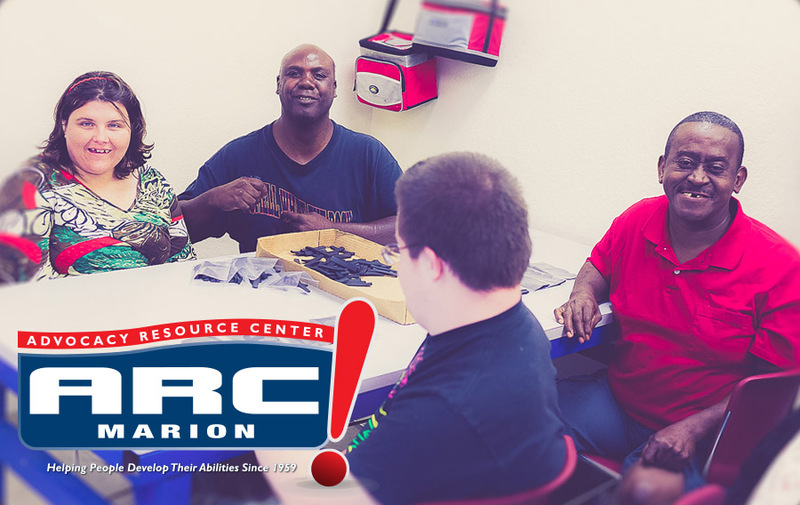 The senior program was developed to meet the needs of an ever growing age group here at ARC Marion. Many people were telling us they wanted to retire, so we developed this program in response and basically looked at what they might expect from retirement. There is no actual age limit and staffing is usually one to five. Daily, the group reads the newspaper and discusses current events. From time to time they do a group exercise video together or some other recreation activity as a group. Something many of them didn’t understand about retirement was the loss of a weekly paycheck. Therefore, seniors are given the opportunity to do a little contract work, so they can earn some money as much as they want to do. Arts & Crafts is a popular choice for seniors, especially seasonal items. We provide vocational training to developmentally disabled adults through actual work experience. Companies (see a list here) in our community contract with us to do “piece rate” work (clients are paid a per piece salary). This allows the individual to grow skills at their own pace and develop other important abilities such as staying on task, manual dexterity, and working with others. We also travel to many of the contracted companies daily, with usually 10 clients and one staff person where they do similar work in an actual manufacturing environment. This gives our clients the opportunity to get real time experience but most importantly to also meet and become friends with others in the community who they otherwise might not have a chance to meet. Our staff to client ratio in the vocational area is one to 10.